To develop and test instruments and devices you will need equipment such as a digital oscilloscope, arbitrary waveform/function generator and multimeter. 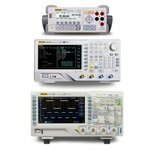 We recommend the following models: RIGOL DS1104Z oscilloscope, RIGOL DM3058E multimeter and a RIGOL DG4102 function/arbitary waveform generator. When choosing these particular models you will get a 10% discount!